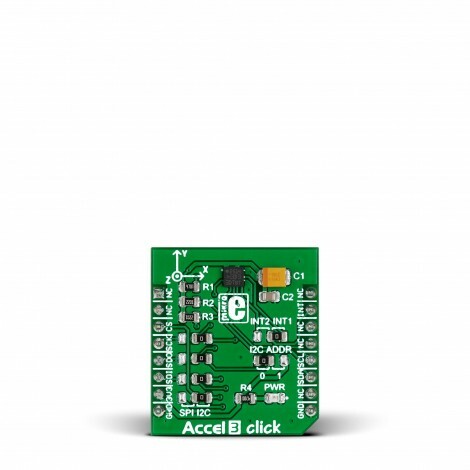 Accel 3 click carries the H3LIS331DL a low-power high-performance 3-axis linear accelerometer. The click is designed to run on a 3.3V power supply. 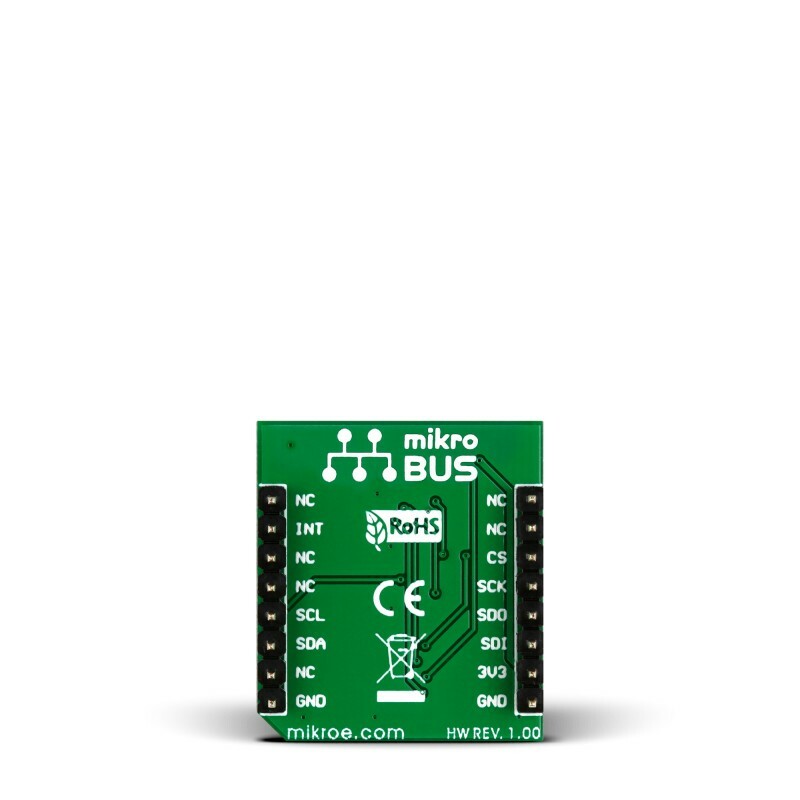 It communicates with the target microcontroller over SPI or I2C interface, with additional functionality provided by the INT pin on the mikroBUS™ line. The H3LIS331DL has dynamically user selectable full scales of ±100g/±200g/±400g and it is capable of measuring accelerations with output data rates from 0.5 Hz to 1 kHz. The “sleep-to-wakeup” function, in conjunction with low-power mode, allows to further reduce the system power consumption and develop new smart applications. The H3LIS331DL may be set in a low-power operating mode, characterized by lower date rate refreshments. In this way the device, even if sleeping, continues to sense acceleration and generate interrupt requests. 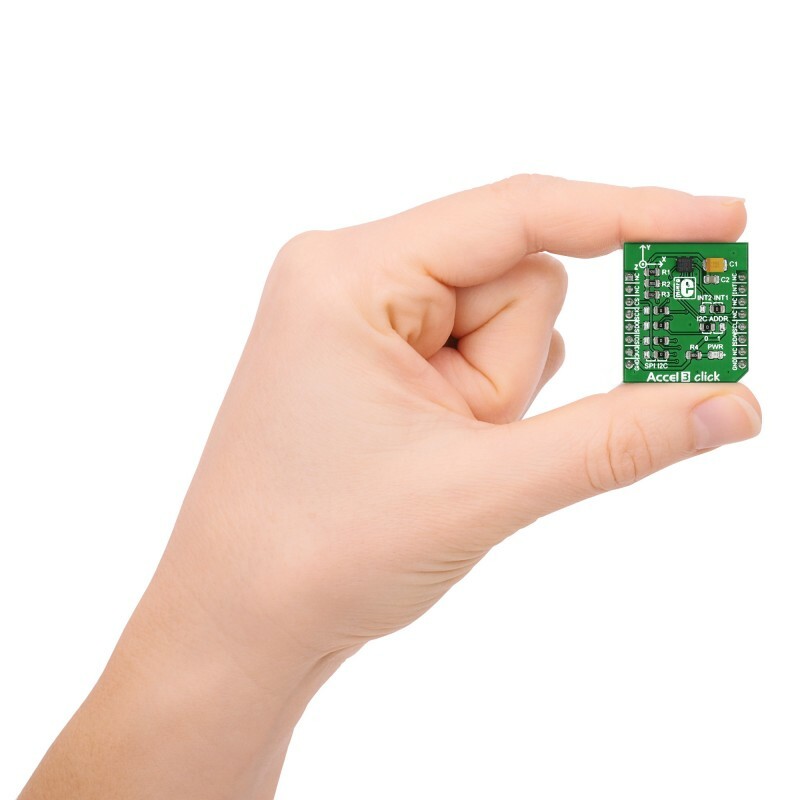 When the “sleep-to-wakeup” function is activated, the H3LIS331DL is able to automatically wake up as soon as the interrupt event has been detected, increasing the output data rate and bandwidth. The four jumpers on the left side of the board are for choosing between the SPI or I2C interface for the sensor output. By default, these are soldered into the I2C position. On the right side of the board, the upper jumper is for specifying which of the two interrupt pins on H3LIS331DL will be connected to the mikroBUS™ pin. 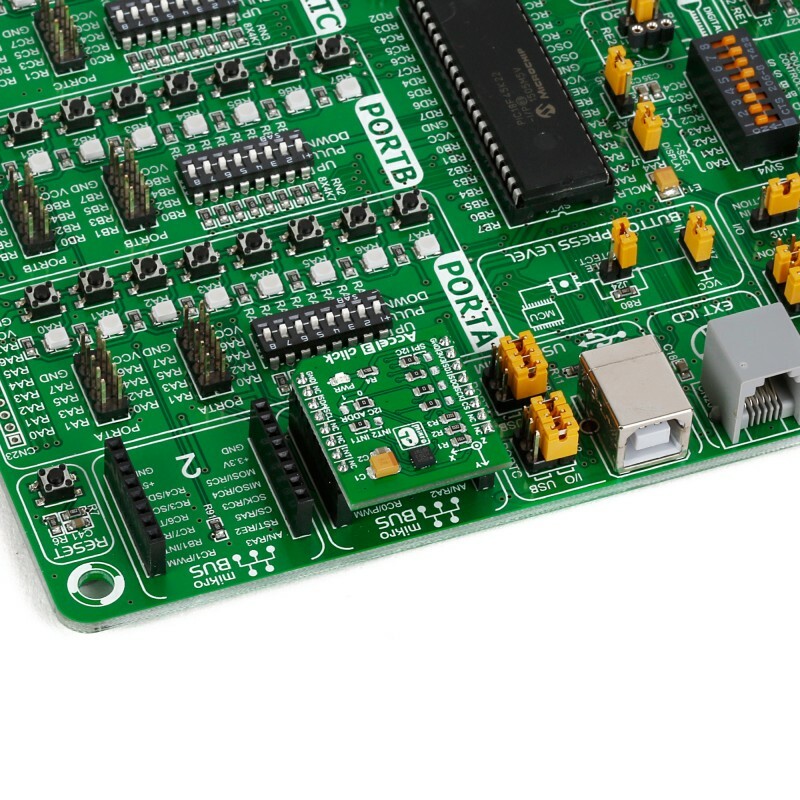 The final jumper is for configuring the I2C address The I2C interface is compliant with both normal and fast modes (400 KHz), both common I2C standards. H3LIS331DL incorporates a sleep-to-wakeup function. In sleep mode the sensor is in a low-power operating mode; it continues to detect acceleration and generate interrupt requests, but with lower data rate refreshments. Once an interrupt threshold is sensed, the device automatically wakes up and increases the output data rate and bandwidth. This table shows how the pinout on Accel 3 click corresponds to the pinout on the mikroBUS™ socket (the latter shown in the two middle columns). This snippet reads three axes' from the accelerometer every 30 milliseconds and displays them to UART. The values displayed have been calibrated and are measured in gs.